Light rain seemed to come and go in 20-minute intervals just before the start of yesterday’s race at Road Atlanta. 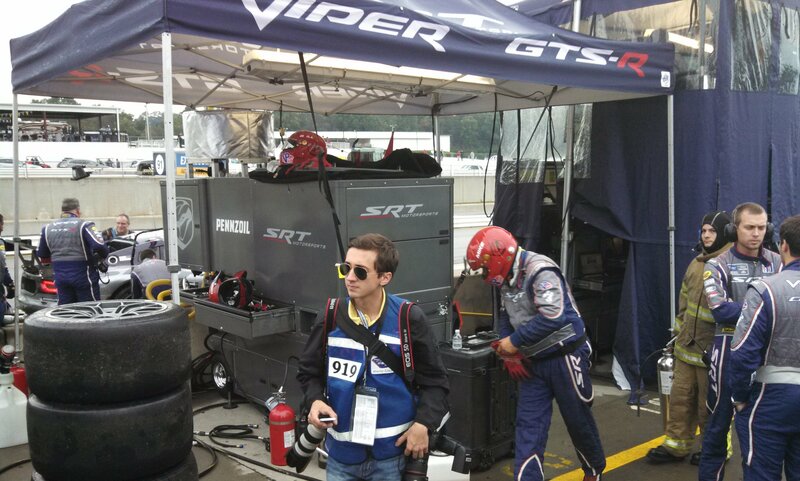 As teams debated tire choices — slicks or wets — we went behind the scenes with SRT Motorsports at Petit Le Mans. The factory team was preparing to run two SRT Viper GTS-R race cars in the GT class of the 10-hour or 1,000-mile race. We got a tour of SRT Motorsports’ race trailers and paddock courtesy of Bill Riley of Riley Technologies, the team’s owner/manager. We also talked tires — “confidential” ones that are leased from Michelin for $1,100-a-pop — with Matt Bejnarowicz, SRT Motorsports’ Viper lead engineer. Watch the video to learn what’s so special about this rubber. Yesterday’s endurance sports car race at Road Atlanta was the final event for the American Le Mans Series (ALMS), but fortunately, it won’t be the last Petit Le Mans. Next year, ALMS joins with Grand-Am in the Tudor United SportsCar Championship. On October 4, 2014, the inaugural season of the new series will culminate with the 2014 Petit Le Mans, which will keep its 10-hour or 1000-mile format. Interesting video. Especially the commentary by Matt.